My favorite flavor profile to cook, as you may have guessed, is Mexican. Every time I make something that doesn’t require a ton of planning and I need to just get something together it winds up being something along the lines of Mexican food. That’s not to say that all Mexican food is easy to make (read: mole is a big deal), but it’s my favorite, so I do it the most and therefore it’s simple for me. I also love spicy food. A LOT. My body is not agreeing with this as much lately, but stock in antacid is probably going up and making someone happy. One of my husband’s #1 all-time favorite dinners that I just sort of came up with is any protein with this creamy chipotle sauce. I make it most often with chicken, but we also use shrimp and I have no doubt that skirt steak and pork chops would love this sauce, too. 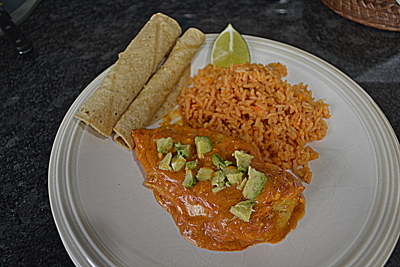 I know for a fact that this sauce rocks on fish tacos, because that’s the hidden gem in this recipe: the sauce makes enough in this dinner to save in a storage container and it makes fish tacos SING the next day (or 2-3 days later). I’m happy to have another autopilot recipe on the menu for the week with the fish tacos, and the husband is thrilled to eat his favorite sauce twice in a week as well. With a lot of Catholics celebrating Lent and not eating meat on Fridays, hopefully this sauce inspires a new meatless Friday dinner…and then some. You’ll need a 7 ounce can of chipotle salsa or chipotle peppers in adobo sauce. 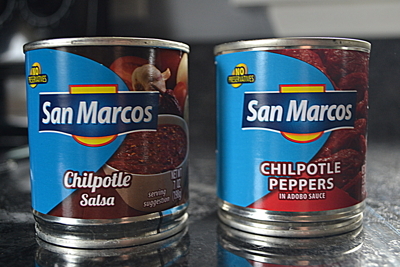 My favorite brand is San Marcos (some brands contain gluten, so be sure to check labels). If you use the chipotle peppers instead of the salsa, you’ll want to blend the can in a food processor first…and be warned, these little cans pack a HUGE punch. Eating this dinner can make my husband’s scalp sweat. Consider yourself warned. I used chicken breasts in this case and we usually have 4 small or 2 large that I butterfly. We get our meat from C & D Family Farms, so the size varies, but typically about 1 lb. works for us with enough for a leftover sandwich (that Bob hogs) the next day. Heat up a deep skillet, add enough olive oil to generously cover the bottom of the pan, and add the chicken. 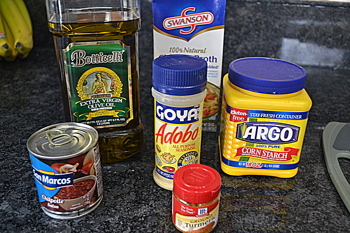 Season with salt, pepper, Adobo (the seasoning by Goya, not the chipotles in adobo sauce), and tumeric. Once you turn the chicken over, add the onion and garlic and get a sear on the other side of the meat. 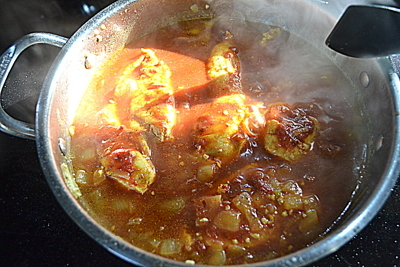 After the chicken is golden and onions are starting to become softened, add about 1/4-1/2 cup of chicken broth and let the meat and aromatics cook in the liquid to finish. I typically add 1/4 cup of broth at a time, maybe 2-3 times more, to achieve this. This is fine–you’re building up a sauce. After the meat is completely cooked through, add the can of chipotle sauce, using a splash of broth to get the small remainder from the can. Stir and simmer. When this reduces a bit, add about 1/2 to 3/4 cups of chicken broth and get it back to a low boil. Add cream cheese and sour cream, whisking with a fork to break down and distribute throughout the pan. Once all the cheese and sour cream have blended in, stir in by spoonful the corn starch, doing so until the sauce has thickened to a rich gravy. You want to be able to spoon this, but it should not be thick enough to hold shape. Plate with rice (my recipe can be found here), heated tortillas, and a squeeze lime if desired. I usually serve with a side of veggies or a salad to help cut the heat between bites. For the Fish Tacos: Save the sauce left over in the pan in an airtight container in the fridge for up to 4 days. You can use this on fish tacos: simply pan-sear Alaskan white fish (or your preferred seafood) in olive oil with salt and pepper, top a heated tortilla (corn is our preference) with the fish, this creamy chipotle sauce and chopped onion and cilantro. Bam. 2 meals and one amazing sauce. Heat up a deep skillet, add enough olive oil to generously cover the bottom of the pan, and add the chicken. Season with salt, pepper, Adobo (the seasoning by Goya, not the chipotles in adobo sauce), and tumeric. Once you turn the chicken over, add the onion and garlic and get a sear on the other side of the meat. 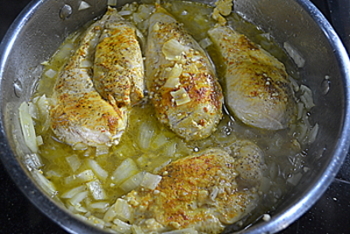 After the chicken is golden and onions are starting to become softened, add about 1/4-1/2 cup of chicken broth and let the meat and aromatics cook in the liquid to finish. I typically add 1/4 cup of broth at a time, maybe 2-3 times more, to achieve this. This is fine--you're building up a sauce. When the meat is completely cooked through, add the can of chipotle sauce, using a splash of broth to get the small remainder from the can. Stir and simmer. Once this reduces a bit, add about 1/2 to 3/4 cups more chicken broth and get it back to a low boil. After all the cream and cheese have blended in, stir in by spoonful the corn starch, doing so until the sauce has thickened to a gravy. You want to be able to spoon this, but it should not be thick enough to hold shape. Plate with rice (my recipe can be found on www.chicagocousinsreview.com), tortillas, and squeeze lime if desired. 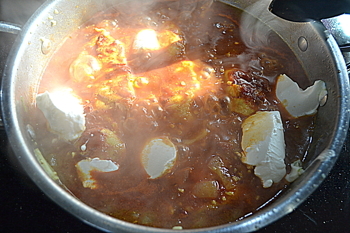 Save the sauce left over in the pan in an airtight container in the fridge for up to 4 days. For Fish Tacos: simply pan-sear Alaskan white fish (or your preferred seafood) in olive oil with salt and pepper, put on a heated tortilla, top the taco with this sauce and chopped onion and cilantro. That looks really good and easy to make. Thank you! Let us know how it turns out if you do–pics welcomed! If you do, let me know how it turns out!